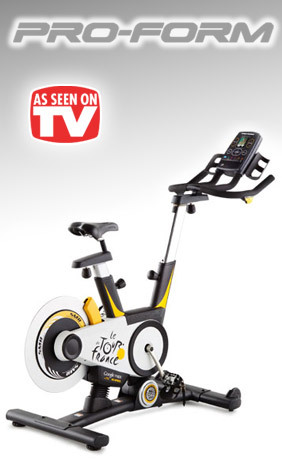 ProForm 2012 Le Tour De France Indoor Cycle is truly a revolution in exercise bike technology. It offers an incredible combination of innovative features, cutting-edge technologies and exceptional build-quality that make it one of the finest indoor exercise bikes on the market today. Get the experience of riding outside without leaving the comfort of your own home. You draw the route – anywhere in the world – and iFit technology powered by Google Maps automatically downloads the map to your console. What you see is exactly what you feel – every hill, every flat and every decline. This versatile indoor cycle delivers more options for a greater benchmark performance. With 24 digital gear controls you can personalize any workout. Interactive incline and decline controls allow your bike to follow the road. Intelligent wind resistance factors in your height and weight for a calculated drive. Train like a pro with Le Tour de France indoor cycle. iFit® Technology Powered by Google Maps™ – With the iFit Technology Powered by Google Maps you can ride anywhere in the world! Choose from 24 pre-mapped courses or create your own. Ride over the Passage du Gois or climb the hills of Mont des Alouettes in France. Now you can experience these same trails and more on this Indoor Cycle. With iFit Technology you can ride where the Pro’s do. The world is at your fingertips. Map any route and enjoy the ride! Google and Google Maps are registered trademarks of Google, Inc. Includes one year iFit membership for free. 20% Digital Incline and Decline Controls – Realistically Reproduces What the Street Does – Introducing incline and decline that matches the street! Now, you can experience any route around the world and Le Tour de France Indoor Cycle automatically adjusts the incline and decline to simulate the terrain! No matter the route, no matter the map, your bike moves to follow the road. So, you get a realistic workout-just as if you were outside-but without the traffic, potholes and weather. Now you can have the perfect day on your road bike every day of the year with Le Tour de France Indoor Cycle. Built-In Power Meter – The built-in power meter is an internal device that allows you to monitor your watts and RPM’s directly on the console. Eliminate the hassle of attaching a separate device to measure your watts and RPM’s—the ProForm Tour de France Indoor Cycle comes equipped with a built-in power meter. The built-in power meter is an internal device that allows you to monitor your watts and RPM’s on the console as you ride. The power meter allows you to tune-in to your ride and monitor your watts and RPM’s for a better benchmark performance. Now you can make certain that you are challenging yourself while perfecting your ride. With the power meter you can get real-time feedback on how hard you are training. Handlebar Shifters – You can now conveniently alternate gears just like you would on your road bike with the new Handlebar Shifters! Right and left Handlebar Shifters simulate front and rear sprockets just like your road bike. – Introducing the new and improved Handlebar Shifters that simulate the same resistance change you would feel on your road bike. They are better than ever with convenient placement on the handlebars so you can stay focused on your ride without disrupting your workout each time you change your resistance. Our innovative engineers have designed the gear resistance to match that of your road bike—the left shifter adjusts resistance in the front sprockets while the right shifter adjusts resistance in the rear sprockets. With 24 different resistance levels you can adjust your ride by the slightest amount possible on an indoor cycle and develop more cardiovascular strength. Intelligent Wind Resistance For a Uniquely Personalized Exercise Experience – Any indoor bike can give you resistance – but only Le Tour de France Indoor Cycle can give you Intelligent Wind Resistance. Intelligent Wind Resistance automatically adjusts the resistance of your bike based on your wind profile. Our smart technology calculates your height and weight to apply the natural resistance you would get out on the road. A climb in your basement is exactly like a climb outside. The ProForm 2012 Le Tour De France cycle is an exceptionally well-built and full-featured exercise solution that is designed to provide you with a exceptionally effective workout. This top-quality exercise bike from ProForm will have you getting fit and dropping those extra pounds before you know it. It’s not the official training bike of Le Tour de France for nothing! If you’re serious about getting into shape and staying that way ProForm offers the answer you’ve been looking for with their high quality fitness solutions. What are you waiting for? Order a ProForm 2012 Le Tour De France Indoor Cycle and get ready to get into the best shape of your life. ProForm stands behind all of their fitness products and they fully guarantee your satisfaction. Simply purchase your fitness machine (direct from ProForm) and use it for up to 30 days. If you’re not 100% satisfied with the results for any reason, simply contact ProForm within 30 days of receipt to request a Return Merchandise Authorization number. Once you’ve received your RMA# return the machine (including any accessories) in its original condition and packaging to receive a full refund, less a 10% restocking fee (unless the merchandise is defective) and the shipping & handling charges. * The above guarantee is for purchases made through ProForm only. Be sure to check the current return policy of all retail partners presented on TVgyms.com for the most up-to-date information.